Cathedral Choir recorded four songs for Minnesota Public Radio’s Bring the Sing event. 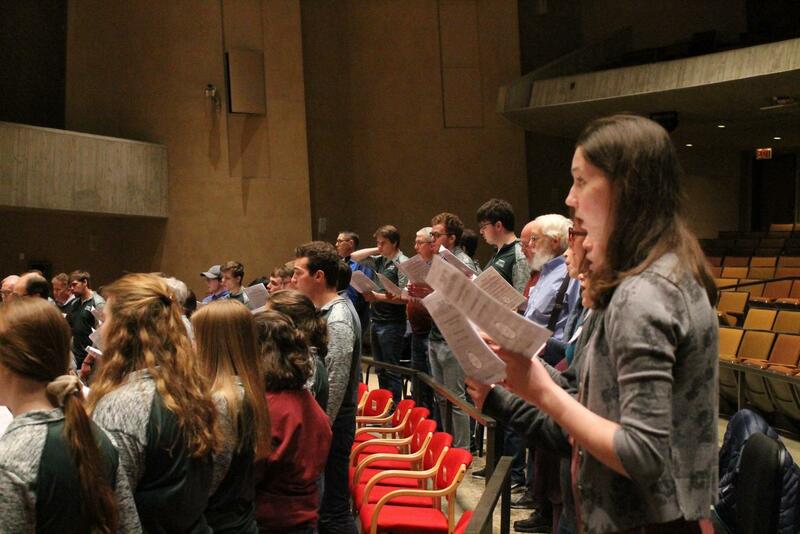 Over 100 Luther students and Decorah community members gathered together on Saturday, April 14 at 10 a.m. in the Center For Faith and Life for Minnesota Public Radio’s Bring The Sing, an event that joins communities together through music. MPR has hosted Bring The Sing events in Duluth; Rochester; and Moorhead, Minnesota, but this was the first time that Bring The Sing visited Decorah. 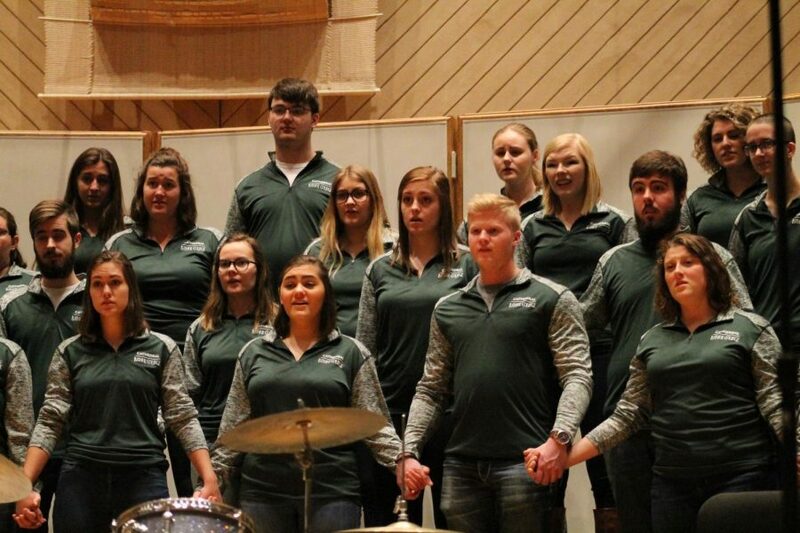 Luther College is an educational sponsor of MPR and connects with the organization to bring programs, such as Bring the Sing, to the local community. Luther’s Bring The Sing will be broadcasted at 7:00 p.m. on May 4. Director of Choral Activities and Assistant Professor of Music Andrew Last (‘97) and Instructor in Music Mark Potvin (‘01) led the event. Cathedral Choir served as an anchor for the event; they were interspersed among the other students and Decorah community members. Cathedral Choir recorded four of their own songs in addition to the four community songs chosen for the event. Potvin said the purpose of the event was to reach out to others who may not otherwise have the opportunity to sing in a group setting. The event began with rehearsal, followed by an hour-long lunch break in Peace Dining Hall where participants got to know one another. After the group reconvened participants learned four songs together and then recorded them to be broadcasted. Cathedral Choir members performed with community members for Minnestoa Public Radio’s Bring the Sing event held in the CFL on April 14. Potvin and Last were responsible for choosing the four songs for Bring The Sing. Two of the songs were chosen from a list that MPR provided. One of the songs, “Draw the Circle Wide,” was used at every prior Bring The Sing event. Last and Potvin chose the remaining two songs based on Luther’s choral traditions, including a piece from Geaorge Frideric Handel’s “The Messiah” and “The Pasture” by Z. Randall Stroope, which was a favorite song of former Luther Choral Director Weston Noble (‘43). Cathedral Choir member Kate Wyre (‘20) said that she enjoyed meeting new people while singing. Wyre noted that many of the participants are currently in community choirs or had some form of singing experience. The setup of the event allowed people to learn from one another through their different relationships to music. Potvin says that Bring The Sing will ideally become an annual event for Luther. He sees it as an opportunity for Luther to share choral traditions with the community.